Your Finance Formulas: Don't Be Left For Debt! Know Your Options! Don't Be Left For Debt! Know Your Options! Debt is a terrible thing, and the one thing we all struggle with when we find ourselves facing a mountain of debt is how to keep a cool head on the whole situation. It's all well and good for people to tell you that keeping your finances simple and straightforward is the best way to get out of debt, but so many of us have tried to conserve finances in the face of debt and ended up failing miserably. You could take a (metaphorical) guillotine to the vast majority of your outgoings, and still find yourself no better off. This can be incredibly demoralizing, but the thing is that when you are trapped in the whirlpool of debt, a lot of people don't know what their options are. So let's go through a few. This may be a very good way to get yourself out of a temporary bind. If you find that you are a month or two behind on payments, rather than facing more considerable debt, it's best to get in contact with your creditors to speak about the problem, and how you plan to get back up to speed. It may be that they will give you options, or you could suggest to them that you would like to pay a lower amount over a longer period of time, or you could ask the creditor to reduce the interest on the debt. It may not end up in a result that pleases you, but at least you will have asked! There are efficient ways like these to get over a short term problem and stop your creditors from taking any action against you. This is where you can negotiate a settlement with your creditors for a lower amount than your total debt. The options are that the settlement could be paid out in one lump sum or through monthly payments which can go up to a period of 60 months. This option is something that's worth thinking about before heading towards the bankruptcy option, and while consumer proposals offered under the bankruptcy and insolvency act (in Canada!) are dealt with by an insolvency trustee, this doesn't affect something like your mortgage. The other benefits of a consumer proposal are that it will stop your debt accumulating interest, and it stops all debt collection made by the creditors, as well as this, your home and assets will remain firmly in your control. A very popular option, this can be done through your bank, or you could refinance your mortgage to pay off the debts. This is a good way to pay off all your debts instantly, and then you will repay the bank with a monthly payment. The benefits of this is that you can discuss the interest rate as well as the loan amount. When it comes to refinancing your mortgage or taking out a second mortgage, which both lets you borrow against your home's equity, it's always best to speak to a mortgage advisor to help you get a great remortgage deal. If you have equity in your home, this is a very good option as it's the most affordable way to borrow money. Most people consider this to be the last resort. However, bankruptcy is actually a reasonable option as long as you don't own significant assets. So for example, if you rent a property, and have minimal outgoings or investments, this could be a better option for you to emerge out the other side relatively unscathed. With bankruptcy, you are in the hands of a licensed insolvency trustee who will wipe out the debt, and use any assets to pay the creditors. There are various options, and if you are looking to wipe the slate clean quickly, the best approach is to file for chapter 7 bankruptcy, as this is one of the shorter processes in comparison to other bankruptcy codes, such as chapter 11 or 13. In filing for bankruptcy, it stops any creditors chasing you for money as well as stopping any pending lawsuits in their tracks. It's important to remember that if you go down this route, it will remain on your file for at least seven years, depending on the bankruptcy route you pursue. Paying off your debts needs to be a big priority in your life, but it's also important to know your options if you ever find yourself saddled with debt. 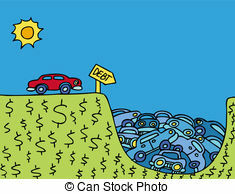 By knowing your options when in debt, you will have a better view of the overall situation and how to deal with it.